ITEM F246E11CL4 - 48" x 144"
Grid Thickness - Top 9/32" 9/32"
Grid Thickness - Bottom 15/64" 15/64"
Sizes (Width x Length) 48" x 144" 48" x 144"
Fiberglass Grating is a lightweight and sound alternative to Steel or Aluminum Gratings. Corrosion-resistant and fire-retardant, the product line is ideal for use outdoors or in corrosive environments. McNICHOLS carries Molded and Pultruded construction types in a variety of sizes, resins, and colors. Most Fiberglass Grating has a slip-resistant, gritted surface to help prevent slips and falls. Fiberglass Grating Stair Tread Panels are also available from McNICHOLS! Consider Fiberglass Grating uses and physical requirements such as exposure to chemicals and/or extreme temperatures. Determine fire retardant needs as well as loading, span and support requirements. Several Fiberglass Grating products comply with the Americans with Disabilities Act (ADA) when installed to written standards. We invite you to browse Fiberglass Grating applications in our Gallery. Choose from a variety of Molded (Square or Rectangular) or Pultruded (I-Bar, T-Bar or Wide T-Bar) construction types. Determine the series type and name (MS-S-150, MS-I-6010 - DURAGRID®, etc.) of the Fiberglass Grating product for your project. Items that comply with the Americans with Disabilities Act (ADA) standard will have this language indicated in the item description of the applicable product. Choose the resin and type for your application (e.g. SPF Polyester, SVF Vinyl Ester, SGF Polyester, SFF Polyester, SPH Phenolic). We provide more information on resins, types and descriptions in the link provided in the Charts section on the Fiberglass Grating Resources landing page. Choose the Fiberglass Grating color (e.g. Yellow, Green, etc.) that is right for your project. Fiberglass Grating is supplied in many colors to meet your design needs. 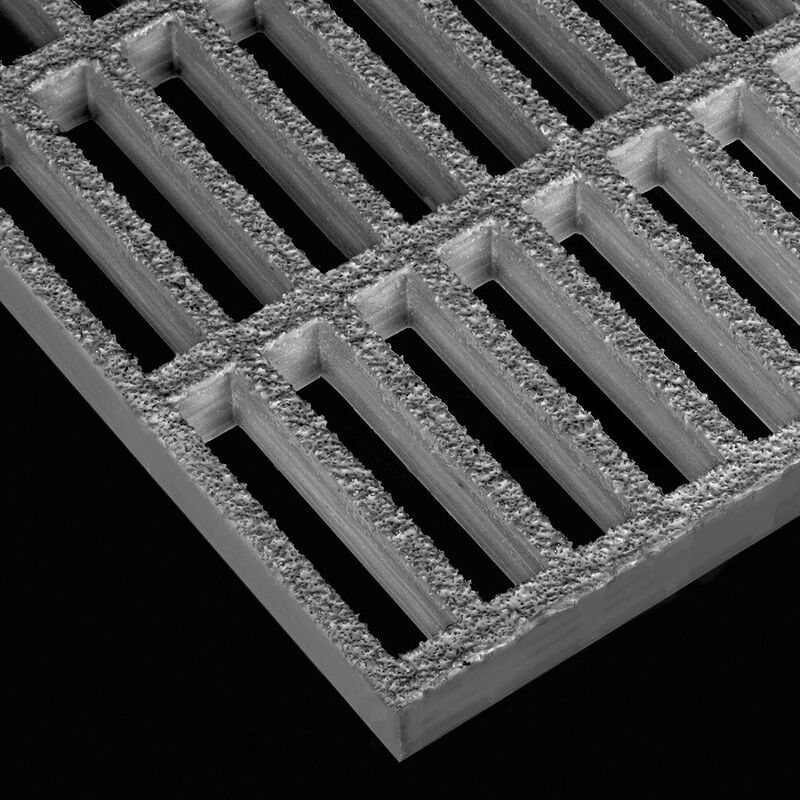 If your selection is Molded Grating, choose the grid height and surface grid pattern (both measured in inches) and grid shape (Square or Rectangular). If your selection is a Pultruded construction type, choose the bearing bar height and top flange width (measured in inches) and bearing bar shape (I-Bar, T-Bar, Wide T-Bar) of the Fiberglass Grating product. Choose the Pultruded Fiberglass Grating spacing (center to center of bearing bars, between bearing bar top flanges, and between bearing bar bottom flanges) desired for your project. Determine if your application requires a concave (Molded construction only) or grit surface. We supply several types of grit surfaces for Pultruded products, including fine, medium and coarse grit. Choose the percentage of open area desired in the panel or pieces of Fiberglass Grating. Choose the direction the Pultruded bearing bars need to run to support the application load. Bearing bar direction is often referred to as span. Clear span refers to the distance in-between Grating supports. Direction of Molded grid (Rectangular pattern only) and Pultruded bearing bars is an important installation consideration. Determine if Fiberglass Grating Accessories like Clips or Fasteners/Hardware, etc. are needed for your project or application. View McNICHOLS® Fiberglass Grating Resources on tolerances, types, available sizes, and more! Helpful McNICHOLS® Fiberglass Grating load tables to save, print, or share! Grid Thickness - Top 9/32"
Grid Thickness - Bottom 15/64"
Sizes (Width x Length) 48" x 144"